When: Classes start the second week of June 2017 (Tuesday & Wednesday). The Art of Rug-Weaving During A Special One-Day Workshop. Join Master-Craftsman Hayk Oltaci, for a day-long workshop on March 25, 2017, at Hayko Fine Rugs and Tapestries, Long Island City, NY. Learn the art of rug weaving and discover the ancient art of rug making! Includes instruction and materials. You keep your weaving-loom kit, weaving frame, pick-up stick, yarn needle, weaving warp and yarn. Lunch is included. Master-Craftsman, Hayk Oltaci invited to Vancouver to teach the Ancient Art of Rug Weaving. Join Hayk Oltaci, from New York City, for a day-long workshop on May 6, 2017 at St. Vartan Armenian Church of BC. 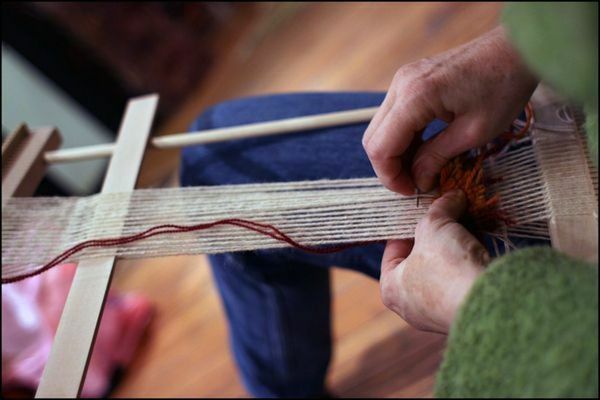 Learn the art of rug weaving and discover the ancient art of rug making! 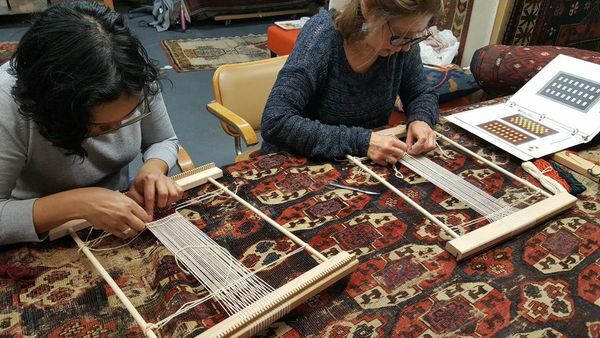 The purpose of this workshop is to promote the ancient art of rug weaving to Armenians around the world. If you are an arts and crafts lover, this is another medium you will simply love to work in. We are starting off with beginner’s workshops with the hopes of creating a future rug-weaving circle. Join Master-Craftsman, Hayk Oltaci, for a workshop of four evenings this January in Laguna Beach, California at Alexander Rug Gallery. 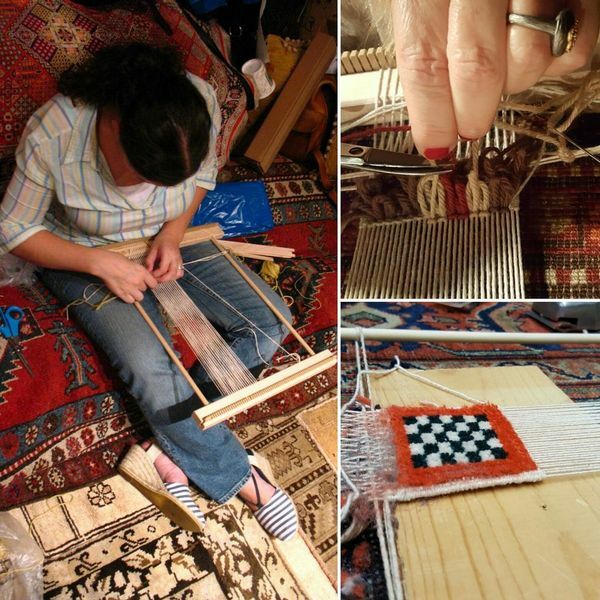 Learn the art of rug weaving and discover the ancient art of rug making! (Tuesday, Wednesday, Thursday & Friday). * January 17; Tuesday, 7:00 p.m. – 9:00 p.m.
* January 18; Wednesday, 7:00 p.m. – 9:00 p.m.
* January 19; Thursday, 7:00 p.m. – 9:00 p.m.
* January 20; Friday, 7:00 p.m. – 9:00 p.m. Cost: $245.00/per person, Includes instruction and materials. Join Master-Craftsman Hayk Oltaci, for a day-long workshop on January 21, 2017, at the Ararat-Eskijian Museum, Mission Hills, California. Learn the art of rug weaving and discover the ancient art of rug making! When: January 21, from 9:00 a.m. to 5:00 p.m. Cost: $245.00/per person (includes the instructions and materials). 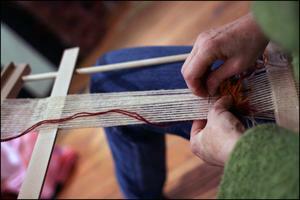 Enjoy traditional music and tea while learning how to weave a traditional rug on your own loom! Everyone leaves with their own mini rug. All materials and supplies are provided. Limited seating, reservations required. (10 people per session). Learn How to Weave Rugs, Classes start the first week of December 2016 (Tuesday & Wednesday). Join master Craftsman, Hayk Oltaci, for a workshop of four evenings this December in Long Island City at Hayko Fine Rugs and Tapestries. Learn the art of rug weaving and discover the ancient art of rug making! When: Classes start the first week of December 2016 (Tuesday & Wednesday). Regular Price: $245.00/per person, Includes instruction and materials. This antique Luri Bakhtiari rug was woven in the Luristan province of western Persia, circa 1910s. There are several characteristics that make this rug an exquisite piece of art. First of all, despite curvilinear floral design combinations of traditional Persian rugs, this rug is decorated with geometric patterns. 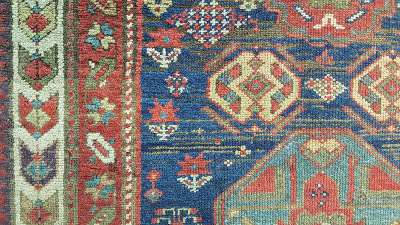 Although Persian Heriz and Serapi rugs are considered geometric in patterns, those are apparently stylized floral designs, while the motifs in this rug appear to be strictly geometric and encompass many characteristics of Caucasian rugs. Against this background, close examination reveals that the distinctive designs of this rug are derived from a creative combination of Persian and Caucasian motifs. For example, the two octagonal medallions on the abrashed-blue main field have the feel of Caucasian designs, yet the inside of each is decorated with Persian stylized-floral patterns. One of the two remaining medallions in the middle is inspired by Persian “Shah-Abbas pattern,” and the other by Caucasian diamond pattern. The rest of the main field is decorated with trees, flower plants, palmettes, rosettes, diamonds, and stars, all of which bear the combination of Persian and Caucasian elements. Another appealing characteristic of this rug is that it has two equally-balanced primary borders instead of one; and, no secondary borders. Only thin barber-pole patterns surround the borders. The white ground of the outer border amplifies the rich colors and exquisite designs of the main field. In fact, it makes us realize that this Luri Bakhtiari rug is created through the rendition of the legendary Persian garden design with Caucasian artistic sensitivity. This is an exceptional gem for anyone who appreciates the beauty and the value of antique Oriental rugs. 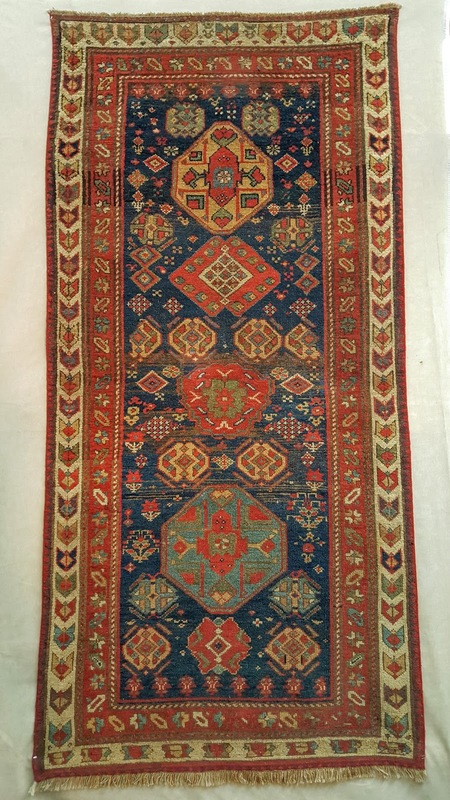 For more information about this exquisite rug, as well as for our ultimate expert service in hand cleaning and repair of your rugs, please contact Hayko by calling at 212-219-8257; (also 24-hour answering service at 212-717-5400); or by E-mail: info@hayko.com. Conveniently located near the 59th Street Bridge and two blocks from the Queensboro Plaza subway stop which is serviced by the N, Q, E, F, G, M, and 7 subway lines. I will be one of the presenters in the featured activities demonstrating “The Art of Rug Weaving:” a hands-on workshop. 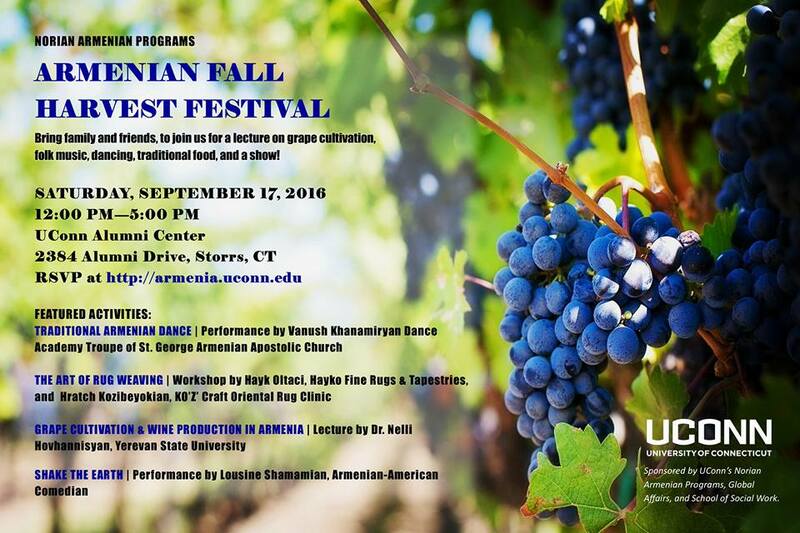 My colleague from California, Hratch Kozibeyokian will be providing a concise introduction to Armenian Rugs. We are excited to announce that as our business has once again outgrown its space, we have moved into a larger building in Long Island City. In the meantime, we have significantly increased our collection of fine antique and semi-antique rugs through recent acquisitions. We are now located at 43-01 21st Street, Unit 110F, Long Island City, NY 11101. This location is even more desirable since Queensboro Plaza, which is two blocks away, can easily be reached by bus or subway from Manhattan in less than 15 minutes. Moreover, we extend complimentary pick-up and delivery service as a courtesy to all of our customers. In addition to our over half-a-century of combined expertise in repairing antique and semi-antique Oriental rugs and European tapestries, we have increased our capacity of hand-washing them at our new location. Undoubtedly, your precious rugs must receive the utmost expert cleaning and repair services to maintain their beauty and integrity for generations. We are committed to providing you with the same meticulous service as we have provided to several museums, an auction house, and many collectors. Building long-term business relationships with our clients is the most important aspect of our mission. Please do not hesitate to call us at 212.717.5400 or send us an e-mail (info@hayko.com) if we can be of assistance to you, or simply answer any questions that you might have about fine rugs and tapestries. To visit our showroom, we are now by appointment only. Schedule your appointment today. We will be delighted to hear from you. Thank you for your interest in joining our February Rug Weaving Workshops. In order to book your space kindly submit payment via PayPal to service@hayko.com or you can mail a check/money order payable to “Hayko Fine Rugs and Tapestries” as well.